LinkedIn is the number one social sharing platform for businesses. It affords a world of opportunity when utilised effectively. However, when not used correctly it can damage an organisation’s reputation. Unfortunately, too many organisations don’t have a Strategy for LinkedIn. Their team members do not have a Code of Conduct. And the platform is not used as part of an Integrated Marketing Strategy. Often these businesses are unaware of the power of LinkedIn and the many benefits it can bring. Targeted strategies and activities that Promote Business Dealings with potential clients and decision-making stakeholders. 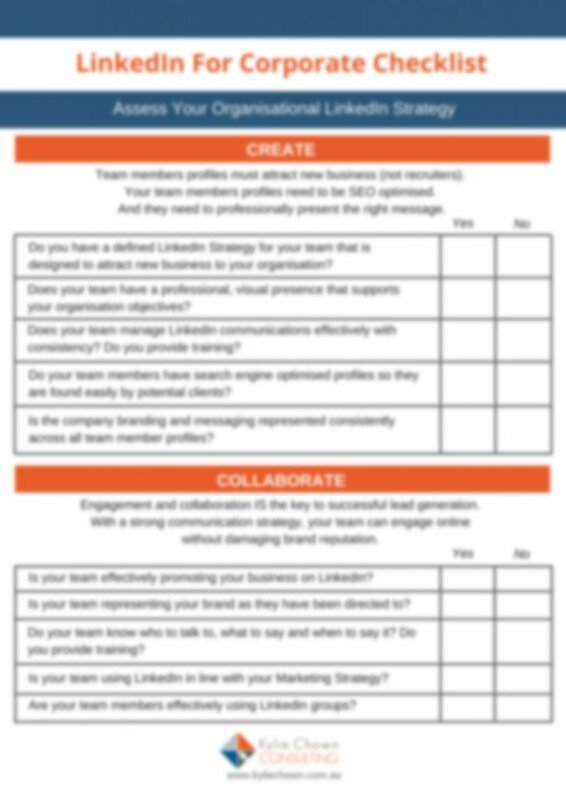 The LinkedIn Corporate Checklist is designed to help you easily and quickly assess the effectiveness of your LinkedIn Profile as well as highlight the opportunities your business may be missing out on.